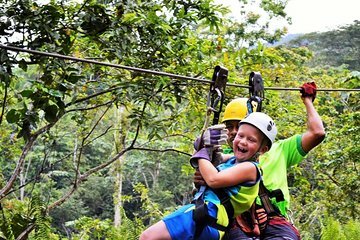 More than a spectacular zipline course with over 1.5 miles of cables, this Cahuita canopy tour is an engaging way for the whole family to learn about the rain forest. A naturalist guide is with you every step of the way to ensure your safety and share information about local wildlife as you glide through the treetops. If you have not booked a hotel yet, you are required to provide this information to the local operator as soon as possible after your purchase. You must be 30 minutes before the pickup in the lobby of the hotel. What to bring: Comfortable shoes, Insect repellent. If you don´t have a natural one we will provide you. IMPORTANT: If you do not have the two passengers at least, the tour is canceled.